Feast your eyes on this beauty with 3 large double bedrooms with lounge/dining and a seperate media room. Large sized kitchen with breakfast bar area. 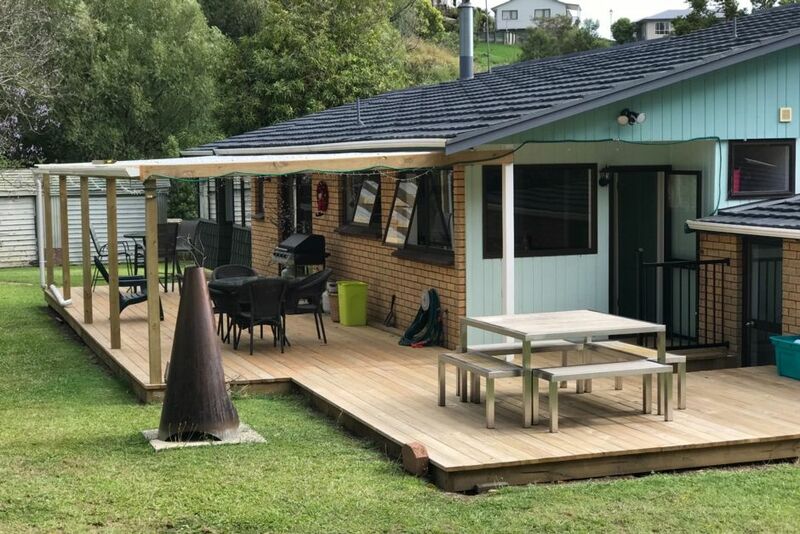 Trees to roam to the north, chooks and grassed area to the south, a stream for a summer cool down to the east and views over the Firth of Thames to the west for the sunset lovers, not forgetting boat ramps, coastal beaches and Kauaeranga Valley up the road. Mix this with peace and quiet, then this could be just what you're looking for! Wide stream at rear of property unfenced set back from the house-please be aware for bookings with kids. This was a peaceful spot with a well set up Bach. In the hot weather the deck was lovely in the evening with the trickling stream in the background. Compfortable beds were appreciated! The location was good for exploring the Thames area. We enjoyed the markets, beaches and swimming hole up the valley. and the house was absolutely amazing. Clean, modern and uncluttered. Great location for Thames and cycle trail. At end of quiet residential street. Lots of room indoors and out. Large bedrooms with soft carpet underfoot. Modern, well stocked kitchen and clean, modern bathrooms. Would recommend. Clean and spacious property with well equipped kitchen. Clean and spacious property with well equipped kitchen. The bedrooms were comfortable and the bathrooms modern. The living areas were great to relax - we so enjoyed using the outside area that we did not use the media room but it would have been great if we had wanted to watch a movie. The garden and seating area outside was lovely to have an evening meal and we enjoyed the sunsets from the front. Very easy location for Thames - an easy drive. We loved the Saturday markets and great cafes! A delightful place to stay in a beautiful setting.